It took some delicious memories of the most endearingly impish man I've ever known to get me back to this blog. 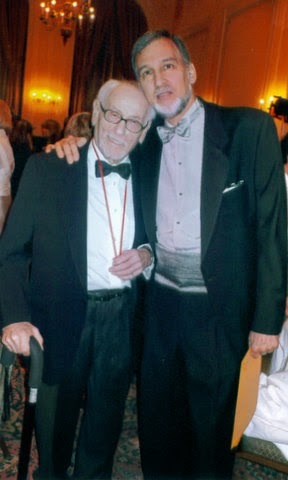 Eli in 2007, the recipient (with Anne) of the Dutch Treat Club Gold Medal for Lifetime Achievement in the Arts. Thirty years ago, I spent seven unholy days and nights in Israel with Eli Wallach and Anne Jackson—a long week making a short film we knew none of us would ever deserve recognition for. Eli was mischievous. Anne could be… mercurial. Eli would misbehave, knowing full well his Annie would react. And every time she did, I would see this fleeting, impish, glint—a split second flicker of optical grin—flash in his eyes. Anne had to live with it; all I wanted was one shot of it, one photo. It cost me roll upon roll of film as I tried, unfailingly in vain, to capture this, the most classic, of their shenanigans. I fell into a pattern of standing around, camera in hand, trying not to be obvious, but perched at the ready for that glint, that unparalleled optical grin, determined to catch it, trying to anticipate it whenever I saw Eli peer anywhere but into Anne’s reproving eyes. Seeing it coming… and always missing it! Peer Glynt, I began to call it under my breath in frustration. Click! I missed. There it is again! Click! Missed again. Click! Damn! I must have squandered four rolls of high-speed film on trying to capture Eli’s virtuoso “Peer Glynt.” Just once! I never did. I never wanted that shot as much as I do today.